– At the last minute, mix all ingredients and set aside. — Add garlic, carrots, celery and onion and simmer all vegetables for 2 minutes. Add the tomatoes, allspice, oregano and cinnamon. Moisten with the broth, add the chicken, cover and simmer at low heat for 1h30. — Delicately remove the chicken from the saucepan and keep warm. Bring the broth to a boil. Add the hilopites stirring frequently, and cook at low heat until the pasta has absorbed almost all liquid. 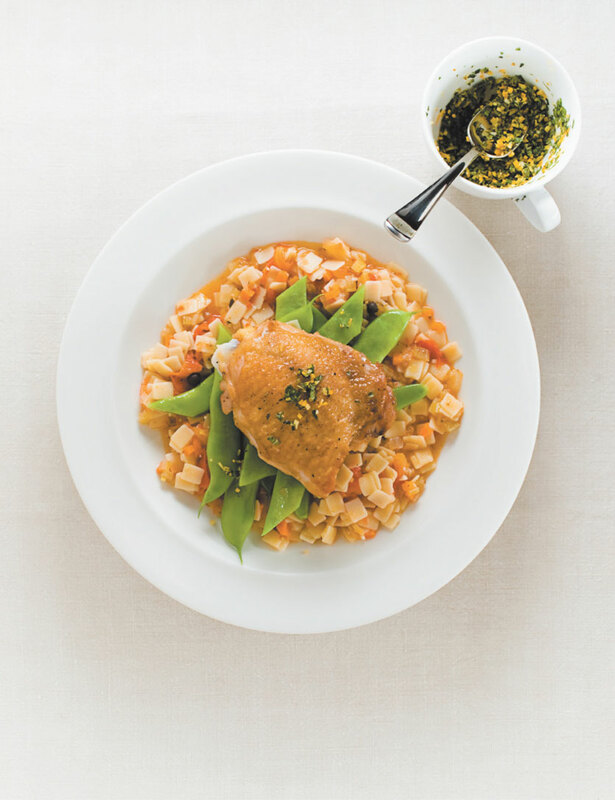 FINALE — Serve the hilopites in a bowl, place a piece of chicken on top and garnish with gremolata. Sprinkle with fleur de sel and pepper. Delicious with Parmesan cheese. NOTE — This dish will fill your kitchen with truly inviting aromas.